Group lessons are fun because students get to ride with their peers. Students get a one hour and 15 minute lesson which includes learning everything from horse managment to center riding with 2-4 other riders. Group lessons are still small classes and encourage individual learning and growth in riding. 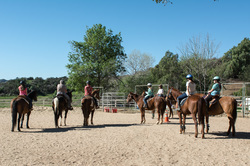 Group lessons are held Monday through Saturday and include morning and afternoon times for riding. Classes are grouped by experience and training desired. (i.e. beginners equitation and pleasure riding, intermediate show team, intermediate trail class, etc.) Students can group with siblings and friends! Helmet, grooming tools, and riding equipment are all included.All lessons include instruction in the arena and on the trail.